Topics>Jesus>Miracle Announced from a Tomb: "He Is Risen!" Declare the news far and wide! Our Lord Jesus has risen from the grave! His resurrection assures us that our sins are forgiven and our future resurrection is certain. Because Jesus is alive, He is with us through each dark night and difficult day. 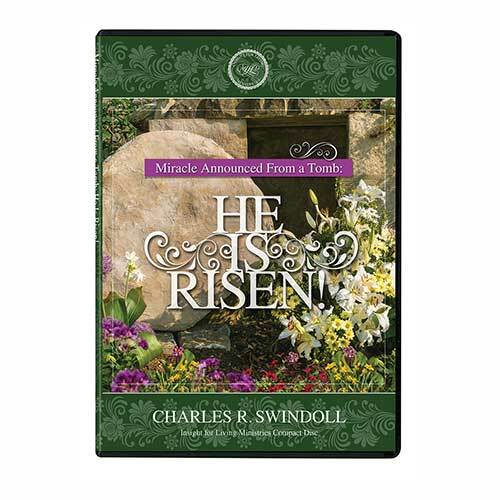 Listen to this Easter message by Chuck Swindoll and relive the moment of discovery when an earthquake shook the ground and a shining angel rolled aside the stone, announcing, “I know you are looking for Jesus, who was crucified. He isn’t here! He is risen from the dead” (Matthew 28:5–6). What a glorious moment . . . what a wonderful Savior! Copyright © 2017, 2018, ℗ 2018 by Charles R. Swindoll, Inc.
Musical performances copyright ℗ 2017 by Stonebriar Community Church.